The Central Public Library in collaboration with the Malta Film Commission screened two of the earliest films shot in Malta, namely, Bolibar (1928) and Sons of the Sea (1925) on a weekend event earlier this month. The screenings were part of the Open Weekend hosted by the Central Public Library to commemorate the 30th anniversary of their current premises in Floriana. Set in Spain in 1812 during Napoleon’s Peninsular Campaign, the story follows the Marquis of Bolibar. After being driven from his home by the French invaders, he conspires with the Spanish leaders to re-enter his town and indicate to them through signals the best method of recapturing it. He is caught and shot, but fate decrees that the executioners themselves unwittingly give the signals, which the dead Marquis had agreed on. Filmed partly in Malta in Ħaż-Żebbuġ and in Mdina, the film also features thousands of Maltese extras. With all the action being set in a fortified Spanish town, it is understandable that Mdina’s fortifications were a perfect fit, and the beautiful square and the church parvis of Ħaż-Żebbuġ were the ideal location to set the town square. Directed by Walter Summers, the film stars Elissa Landi who went on to become a very famous actress in the US. Of the four early films which the Malta Film Commission has brought back to Malta, this is highly significant not only for being the earliest film known to have been shot in Malta, but also for being a landmark film where Admiralty cooperation is concerned. Research revealed that Sons of the Sea is indeed the first feature film with a fictitious storyline and a romantic subplot to be afforded full Admiralty support. The film follows the careers of two young men, Derek who enrolls as a Navy officer and Bill who trains to become a seaman. When WWI breaks out, Derek is sent to fight in the Battle of Jutland while Diana his fiancée, joins up as a nurse and is sent to Malta. Having distinguished himself, Derek is given the command of the destroyer on which Bill is posted. Shortly after the Armistice, Derek’s destroyer is sent to the Mediterranean where he catches up once again with Diana. However, the joy is short lived as Derek’s ship is under orders to sail at once. Diana seeks distraction by exploring a nearby island and has the misfortune to be kidnapped by a roving band of brigands who demand a ransom. Ordered back on shore, Derek leads, the blue-jackets in the chase. 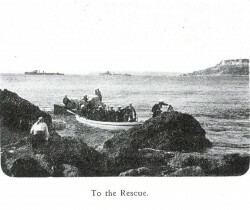 The rescue is no easy feat but after an exciting struggle in which Bill displays much bravery, Derek gallantly rescues the girl from her perilous plight. Only four out of the original six reels survive today, but with over 85 per cent of silent era films considered lost, we can actually be thankful that at least we still have something! The first two reels contain the scenes of Derek’s and Bill’s training and also introduce us to Diana. It can be assumed that the two middle missing reels contained the bulk of naval scenes including the Battle of Jutland as well as Diana’s stay at Malta, while the final two reels have the heroine being kidnapped by the brigands and eventually rescued by her heart-throb. Film enthusiasts, who enjoy seeing Malta used as a film location, will be pleased to know that the last two reels were completely shot on land and sea in the Għajn Tuffieħa and Ġnejna area, Il-Qarraba - the headland separating Għajn Tuffieħa and Ġnejna Bay - is clearly visible a number of times and most of the action surrounding the kidnap and eventual rescue of Diana from the brigands takes place in the area known as il-Minżel tal-Majjiesa. While no specific reference to Maltese people being involved in this production has ever been encountered, one particular article referred to the “Maltese brigands” which leads one to wonder whether the people playing the part were actually Maltese extras.